The threat levels in concurrence with the seismic activity at the Kick ‘em Jenny Volcano is set at yellow which highlights the symptoms of the volcano as restless. The University of the West Indies Seismic Research Center (UWI SRC) reported that as of September 30 there have been high levels of seismic activity at the volcano. The most recent event occurred on Monday, October 1 with magnitudes 3.5 and 3.3 seismic activities. A threat level of yellow indicates that seismicity and/or fumarolic activity are above the historical level or other unusual activity has been observed or can be expected without warning. Marine interests and the general public should be aware of this threat level and strictly adhere to the the exclusion zone of 1.5 kilometers. The situation is currently being monitored and analyzed by the UWI SRC and further updates will be provided. 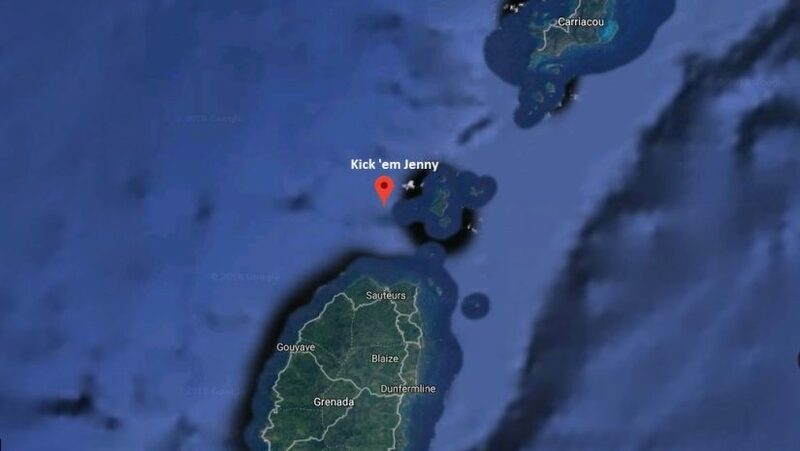 Kick 'em Jenny is an active submarine volcano on the Caribbean Sea floor, located 8 km (5 mi) north of the island of Grenada and about 8 km (5 mi) west of Ronde Island in the Grenadines. It rises 1,300m (4,265 ft) above the sea floor.